Series 7 watercolour brushes are made from the finest selected pure red sable, these brushes are unsurpassed in quality and are the top of the range watercolour brushes from Winsor & Newton. Rustproof and seamless nickel plated ferrules. Black polished handles. 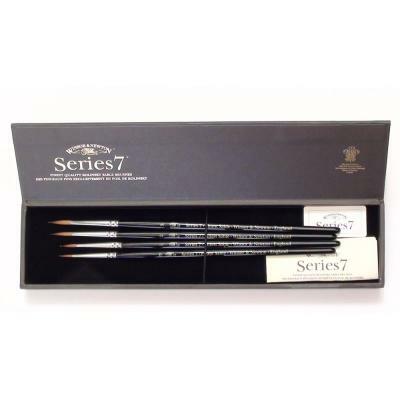 This set of four brushes size 0,1,2 and 3 come in a superb black presentation box and make the perfect gift for any watercolourist. These brushes bought separately at full price are £59.75!! Been an avid painter of War game-miniatures for a bit more than a decade, and if I'd ever recommend a brush to anyone, it's the W&N Series 7's. When people ask what one brush they should own, I usually say a Size 1 W&N. You can paint anything from an eye to a cape with that brush. And if you treat the brush well, it'll last you forever.